West Bromwich Albion produced a clinical counter-attacking display to beat Bristol City and move up to third in the Championship. The Robins, who had won each of their past four games, had 23 shots on goal in an adventurous away display but were ultimately undone by three goals in eight first-half minutes. 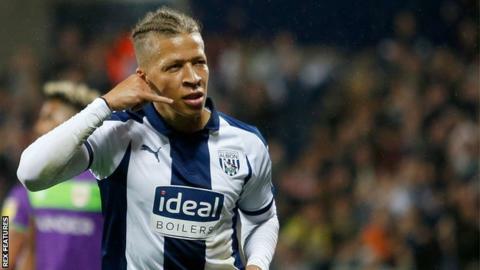 The Baggies went ahead against the run of play when Dwight Gayle was brought down by Adam Webster in the box and Jay Rodriguez fired in from the spot. Gayle doubled the lead following another swift move on the break, slotting in past Niki Maenpaa at the near post, before Rodriguez scored his sixth goal of the season from close range to make it 3-0 before the half-hour mark. Harvey Barnes finished superbly into the top corner after Lloyd Kelly had given City brief hope, before Famara Diedhiou's curling effort set up an uncomfortable final 20 minutes for the home side. Lee Johnson's side spent much of the second half camped inside opposition territory, but for all their pressure were unable to drag themselves to within one goal and create an even nervier ending to the contest. They had also started the match on top, with Matty Taylor and Andreas Weimann forcing good saves from goalkeeper Sam Johnstone, but it was the ruthless finishing of Rodriguez, Gayle and Barnes that proved the difference between the teams. The Baggies have scored more goals than any other side in the Championship and their strikeforce continues to paper over cracks at the back - with no team in the top half having conceded more than Albion. Darren Moore's side have now leapfrogged City into third and remain four points off leaders Leeds. "The game was never over. The threat they posed was always evident. They are one of the better teams in the division. "He [Harvey Barnes] is a good player. We're really pleased to have him here. He's displaying the talent we brought him here for. The West Brom fans can see him for the player he is. "We saw last season, when he was at Barnsley, a talent there and a perfect fit of what we're trying to achieve." "I didn't feel it was a game we deserved to be 3-0 down in but a quality counter-attack and some poor defending cost us. "Not enough went for us, due to us not performing the basics well enough. That's where we need to improve but we've had three clean sheets in four. "Is it an off day or the opposition's quality? It's difficult to say." Match ends, West Bromwich Albion 4, Bristol City 2. Second Half ends, West Bromwich Albion 4, Bristol City 2. Foul by Wes Hoolahan (West Bromwich Albion). Attempt missed. Josh Brownhill (Bristol City) right footed shot from outside the box misses to the right. Substitution, West Bromwich Albion. Sam Field replaces Gareth Barry. Tomas Kalas (Bristol City) wins a free kick in the attacking half. Wes Hoolahan (West Bromwich Albion) wins a free kick on the left wing. Attempt missed. Jamie Paterson (Bristol City) header from the centre of the box is just a bit too high. Assisted by Niclas Eliasson with a cross following a corner. Corner, Bristol City. Conceded by Wes Hoolahan. Attempt blocked. Andreas Weimann (Bristol City) right footed shot from outside the box is blocked. Attempt blocked. Marlon Pack (Bristol City) right footed shot from the centre of the box is blocked. Attempt blocked. Famara Diedhiou (Bristol City) left footed shot from the centre of the box is blocked. Assisted by Callum O'Dowda with a cross. Corner, Bristol City. Conceded by Ahmed Hegazi. Substitution, West Bromwich Albion. Wes Hoolahan replaces Dwight Gayle. Attempt missed. Famara Diedhiou (Bristol City) right footed shot from outside the box is high and wide to the right. Assisted by Andreas Weimann following a fast break. Goal! West Bromwich Albion 4, Bristol City 2. Famara Diedhiou (Bristol City) right footed shot from the left side of the box to the top right corner. Assisted by Callum O'Dowda. Attempt missed. Josh Brownhill (Bristol City) right footed shot from outside the box misses to the left. Assisted by Callum O'Dowda. Goal! West Bromwich Albion 4, Bristol City 1. Harvey Barnes (West Bromwich Albion) right footed shot from the centre of the box to the top right corner. Assisted by Dwight Gayle.